An article written by Doctors George Goodheart and Scott Cuthbert has been cited in 47 other index medical research papers, validating manual muscle testing. This information comes from the online source Scopus. These citations were noted in recently published scientific papers. 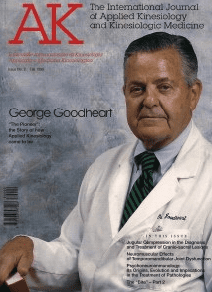 Since 1965 when Dr. George Goodheart first termed our practice as “Applied Kinesiology” (AK), it has taken decades for this exposure and acceptance to occur. As an Applied Kinesiologist, I thank these two authors and the many others who have helped and continue to help AK became part of mainstream healthcare and the validation of manual muscle testing as an invaluable tool in helping our patients get well.